Owning a boa constrictor is a large responsibility. 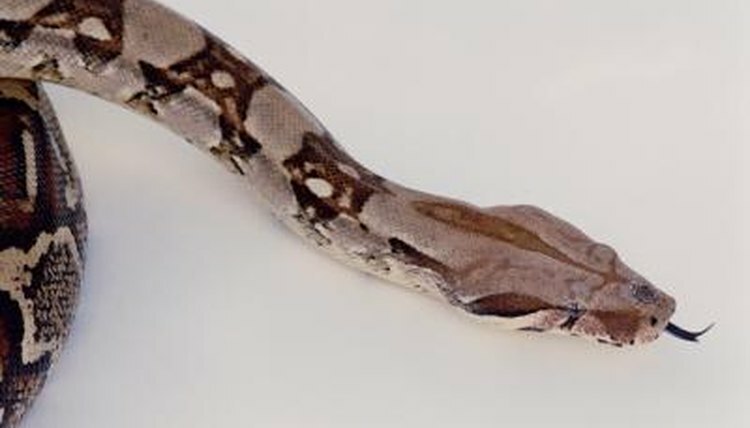 The boa can grow to around 9 feet long and 60 pounds over a life span of 40 years or more. If you are up to that kind of commitment, your baby boa will require specialized care to grow healthy and happy over the long haul. Choosing the right baby boa will help start your relationship on the right foot and ensure you get a healthy pet. Avoid wild-caught animals, as they are often less docile than captive bred snakes and may be sick. When you're shopping, check to make sure the enclosure is clean and only one snake occupies each cage. Look for injuries, mites around the eyes or any gunk or buildup in the mouth. Listen for wheezing. These are signs that the snake may be ill. In addition, watch how the snake responds to handling; if it is fearful, visit other breeders. Your baby boa will need a well ventilated cage that can prevent him from escaping. Glass aquariums with secure mesh tops, or plastic storage tubs with numerous holes in the top for air, will work. Around 40 square inches is enough for a baby. A young adult over 6 months old may need 2 to 4 square feet of space, while adults need closer to 12 square feet. You should provide at least as many square feet of cage space as your snake is long. Aspen or newspaper make good substrate for the floor of the cage. Branches for climbing and a dark place to hide will be much appreciated. Boa constrictors need an outside heat source to maintain body temperature. You can use an under-tank heat panel or a thermostat-controlled heat cable. Place the heat panel or cable on one side of the cage to create a gradient with a basking area that reaches 90 degrees Fahrenheit and an overall ambient temperature of around 78 degrees Fahrenheit. This range will allow your baby snake to regulate his own temperature by moving throughout the cage. Due to their tropical origins, boas need 60 percent to 80 percent humidity to thrive. Keeping a plastic tub of clean water that your boa can climb into and soak in will help him maintain moisture and prevent mites. Small bowls of water will raise the humidity. Consider a timed misting system for hands-off maintenance, or a spray bottle to mist your snake once or twice a day. Young captive boas live primarily on fuzzy mice or hopper mice; they need to eat only once every five to seven days. Overfeeding can lead to vomiting and a decrease in overall health. If your snake is reluctant to eat, try feeding at night or offering freshly killed prey rather than frozen. Once your snake reaches 3 to 4 feet in length, you can reduce feedings to once every 10 to 14 days. As he grows, you can introduce larger prey like rats, hamsters, rabbits and guinea pigs. Rats have the highest nutritional value; guinea pigs have the highest fat content.